Australia and Netherlands will go head-to-head for an 11th time when they meet in the World Group play-offs. The Australian side has been announced, with Sam Stosur, Ash Barty, Daria Gavrilova and Destanee Aiava representing the Green and Gold. The Dutch won the last meeting between the two nations - a 4-1 victory at this stage of the competition in 2015 - but Australia has dominated their past encounters, with eight victories and just two defeats since their first meeting in 1966. 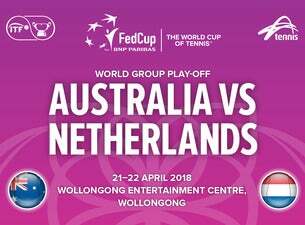 Alicia Molik's side are looking to return to the World Group for the first time since 2015, while Netherlands is looking to prolong its three-year stay in the top tier.